It's National Hamburger Month and it's the weekend of National Hamburger Day. 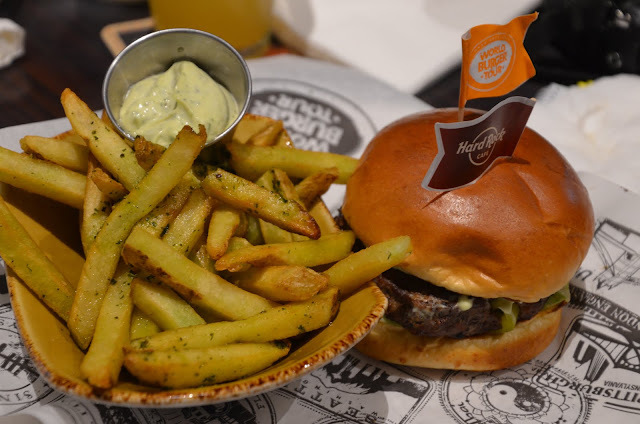 While hamburgers are considered to be a classic American sandwich, Hard Rock Cafe introduced their World Burger Tour menu this month, showcasing eight international versions of their Local Legendary Burger. Hard Rock gives their chefs the freedom to create a Local Legendary Burger that captures the flavor of their city and more than 160 fan favorites were among those considered by the culinary team to be part of the World Burger Tour menu. There were eight final selections, with four available in May and the other four being introduced for June. I had a taste of three of the four. The medium-well burgers that they serve are nice quality and a great base to start with. I was excited to try the English Breakfast Burger, which was a monster - like taller than my glass, but worth every messy bite. It was quite the meaty masterpiece with sausage and ham piled on top of the burger. Then with mushroom and tomato - and baked beans on the side, it was like a full English breakfast in a bun. The garlic aioli, which dripped out with every bite, was a delicious bonus. In lieu of regular fries, there are artisan fry options and I decided to go with Parmesan and Romano with garlic aioli. Quite a yummy side! I snatched a bite from my husband and son of their selections. Hubby got the Jamaican Jerk Burger and I loved the spicy and sweet combo on it. He got it with a side of the herb and garlic fries with chimichurri mayo - a pretty sweet addition. 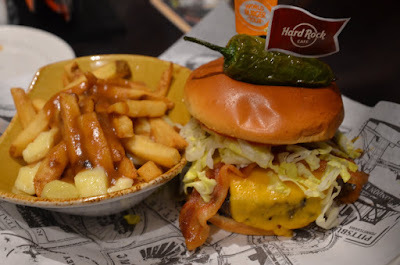 Also loved the Java Lava Burger, a big messy heap with a little kick, which my son enjoyed with an order of poutine fries. I love poutine and these big, gooey Wisconsin curds made my cheesy heart happy. 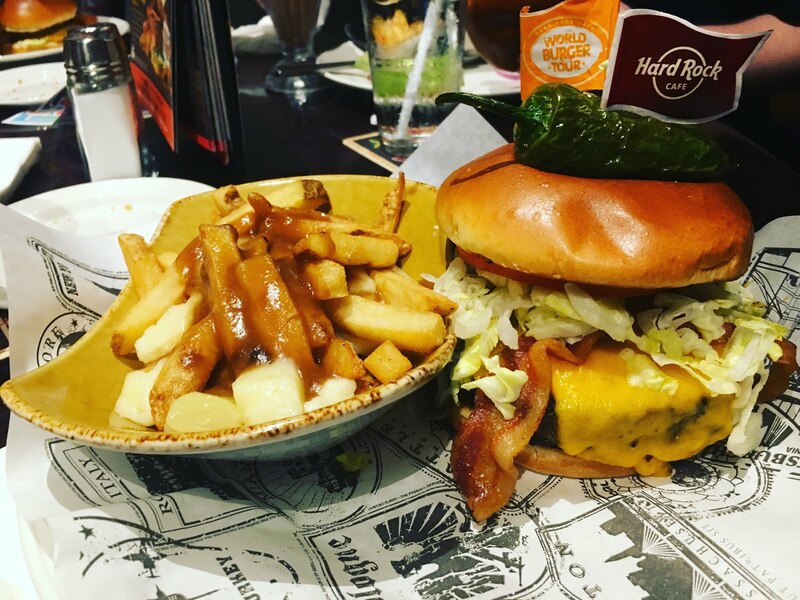 Want to extend your world burger tour? If you're looking to book a rock star vacation, Hard Rock, in conjunction with global experience agency Infrared, is offering a World Burger Tour travel package that includes stops at iconic cities including London, England; Athens, Greece; Buenos Aires, Argentina; and Seattle, United States. This four-stop, once-in-a-lifetime excursion celebrates the cities that inspired Hard Rock’s World Burger Tour. The 10-night trip includes flights and first-class hotel accommodations, ground transpiration and exclusive dining and music experiences at Hard Rock Cafe locations in each city is not typically available to the public, so now is your chance to take a rockin' trip around the world. More info available at worldburgertour.com. 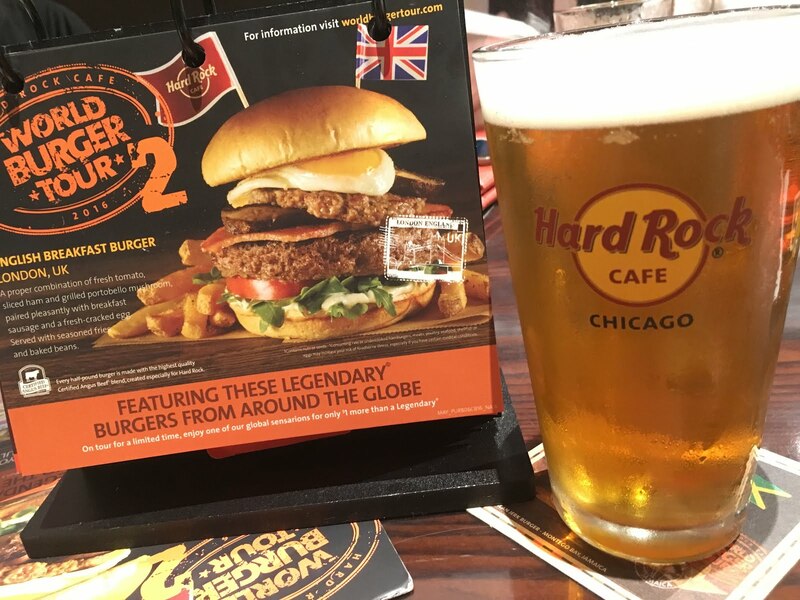 To celebrate this world tour menu, my friends at Hard Rock are offering a gift pack to one of our Chicago Foodie Sisters followers. 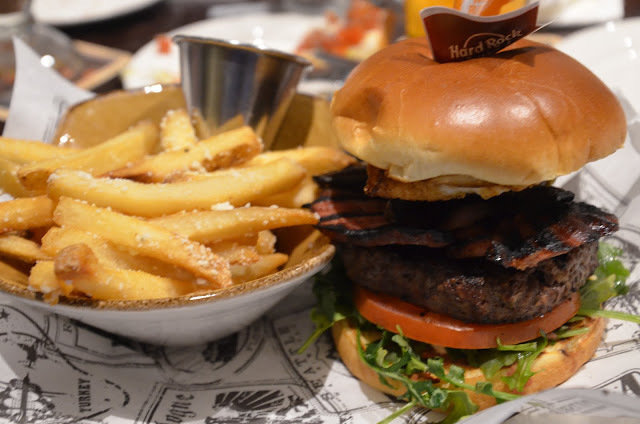 2) Leave a comment on this blog post telling us which burger you'd most like to try. 3) Find our FB post at Chicago Foodie Sisters about the blog post and comment there. Send a direct message on the Chicago Foodie Sisters Facebook page to let us know how you entered and leave your e-mail address, so that we can contact you if you win. Do all three and you get three entries into the giveaway. Contest closes at 11:59 on Friday, June 3. Winner will be notified on Friday, June 4. ***The information, gift card, gift pack and giveaway have been provided to me by Hard Rock International. I was provided with a complimentary meal for the purpose of a review. I was not compensated for this post. All opinions are my own. I'd LOVE the Tango Salsa burger! When we all introduced ourselves here. We were received warmly by all those who participated in the event. Events at Chicago event space are a lot of fun, giving access to features that aren't always the easiest to get into and aren't always the most wallet friendly.